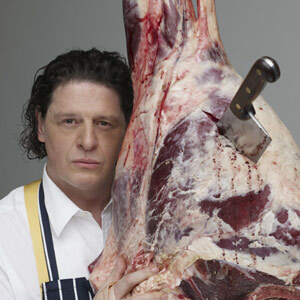 MARCO PIERRE WHITE: the original bad boy chef – kitchen colossus or glorified dinner lady? Beyond sustaining us, and (hopefully) not poisoning us, why does food matter? I believe that the heart of every house is the kitchen. We all grow up at the kitchen table, with our family and with our friends. And I think that’s where the importance of food is born. You’re opening two new restaurants in Dublin. Isn’t there a recession on? I think a recession is the most obvious time to open a restaurant. Look at Ireland last night, look at Ireland today. Weren’t the streets packed last night? Aren’t the streets packed today? Aren’t the restaurants going to be packed tomorrow? Look, here’s my logic. Number one: in doom and gloom, you’re creating something that’s exciting and fun. Number two: everything is cheap to do. Number three: you get the lion’s share of publicity, ’cos no one else is doing it. So it’s entirely logical to open a restaurant during a recession. You occasionally eat in McDonald’s. How do people react when they bump into you in McDonald’s? I don’t pay them any attention. I’m eating my McMuffin. Gordon Ramsay once falsely accused you of stealing a reservation book. Do you hold any grudges? Well he’s a fantasist, isn’t he? You can’t believe a word he says. He said he’d played for Rangers. He’d never played for Rangers. But he’s won three Michelin stars. You can’t knock him for that. As a reality star, does it trouble you that far more people know your bolshy TV persona than have ever tasted your cooking? I’m not confrontational. I believe people should express themselves. I don’t like cowards. A coward is somebody who dies a thousand deaths because they haven’t got the courage to express what they think. But I don’t swear, I don’t scream, I don’t shout. Did you see Hell’s Kitchen ? Yes. In one episode, a woman complained that there was a hair in her dinner. You told her to get lost. Well, you can’t take for granted that it was my hair. She was a journalist. You’re a journalist. We know what journalists are, don’t we? Well, you do anyway. Your job is to fabricate, to exaggerate, but not go over the line to the point where it becomes libellous. It depends on the journalist. I could as easily say it’s a chef’s job to be arrogant and obstreperous. Look, you could get a hair in this restaurant this evening. Right or wrong? It happens. But why did that person come up to complain? There’s a camera on them. It’s their ego. Right or wrong? You should be bright enough to realise that she was trying to get a reaction out of me. In general, though, chefs are allowed much more leeway to be rude than, say, hairdressers or landscape gardeners. Why do you think this is? Well, I don’t think chefs are rude. Service is service. You have to shout instructions. You have to drive the troops forward. It’s like being a sergeant-major in battle. He has to shout out the orders, right or wrong? But it’s not a battle, it’s not war. It is a battle. Feeding 100 people in an hour is a battle, trust me. It’s like a warzone in a kitchen. Do you think the stakes are as high in a kitchen as they are on a battlefield? The reality is you have to feed everyone to a standard. If you don’t feed everyone to a standard, they’re going to start complaining. Once they start complaining, they’re not coming back. If that continues to happen, you’re closing down, aren’t you?